So you made it to the gym, banged out a well-developed program and are now on the road to recovery and adaptation. On your way home you realize that although you just completed an upper body day, your low back starts to ache a bit and your shoulders pinch as you turn the steering wheel. After making it home you sit down for a high quality post training meal. Taking your time to eat, you think back on the day and recap what you did to improve your life and what you can do next. You jot down a few notes before pushing yourself out of your chair. And then it happens…your low back locks up and you crash to the floor. “Damn it, not again!” you spew with disgust. And you are not wrong!! The problem is that if you are only training hard, even if the exercises have been proven to be the most effective exercises to help you reach your goals, it is imperative that you train hard and SMART. And what does smart training mean? I agree here, but without smart work, working harder is pointless! Smart training occurs when your program is developed and implemented in a fashion to help you achieve your goals (if you don’t know how to do this there are experts that can help), AND, you fully understand how to perform the exercises correctly and where you should be feeling the exercises work. For this reason I am going to provide you with a series of videos describing common exercises, the mistakes I often see with how they are performed and how to correct those mistakes. The video below is all about the push up and there is a quick bulleted summary below. Enjoy, and share it with your friends and family because they too will often perform the exercises wrong placing them at a greater risk for injury, keeping them from achieving their goals…so don’t be selfish. Keep an eye out for the next video. – Hips sag or twist and back arches in top position. To fix, engage the core. – You simply “fall to the floor.” To fix, actively pull yourself into the push up by bringing your shoulder blades together on the decent. – Hips sag or twist and back arches on decent. To fix, keep core engaged throughout. – Your elbows go behind the body at the bottom of the push up, forcing an anterior tilt of the shoulder blade (not good). Stop when the elbows are in line with the body. – Hips sag or twist, back arches on the push back up. To fix, keep core engaged as you push back up and don’t allow the chest to lead you out of the bottom of the push up. – You don’t finish all the way through and shoulder blades pop off the back to finish. To fix, fill out the gap between the shoulder blades at the top of the push up. – Your neck over extends or your head drops. To fix, keep the chin tucked and eyes down to keep the neck in a neutral position. – ***You should feel the push up working the core, chest, shoulders and upper back! You should not feel the push up working the low back or discomfort in the shoulders. With the music bumpin’ in the background, your shirt saturated with sweat and the blood surging through every muscle in your entire body, you grind out your last set of an intense training day. Taking a seat and a swig of water you pencil in your weights used and the reps completed. After cooling down you gather your training gear, toss it in your gym bag and make your way to the car. Driving home you, scarf down your post training shake and an apple. 20 minutes after you get home you compile a beautiful breakfast of eggs, veggies, sprouted grain bread, almond butter and a banana. 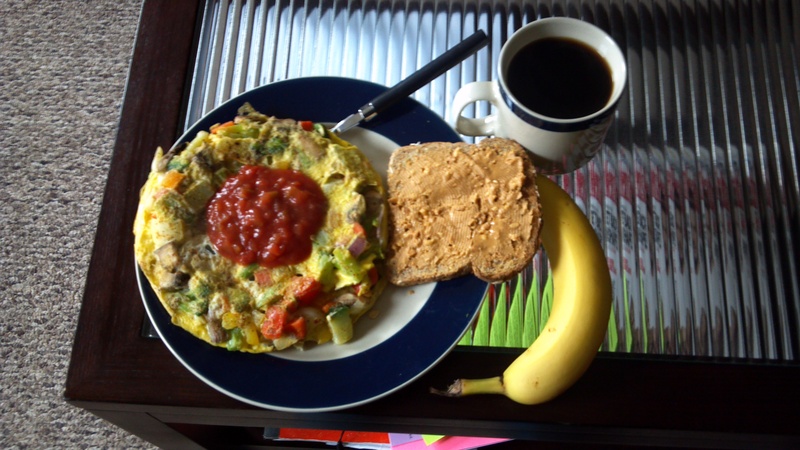 Veggie omelet, Ezekiel toast with almond butter and a banana…a true breakfast of champions! You wash that down with a cup of coffee and some more water. As you start to get ready for work you realize you are still not completely satisfied, so you grab a handful of trail mix. On the way in to work your stomach grumbles so you stop at a convenience store and snag a yogurt parfait as the only other option was a nasty breakfast sandwich. The parfait is quickly consumed and you are back on your way. Getting to your desk you situate yourself and take a seat. Not 15 minutes later you recognize that your stomach feels, well empty. “What the hell?” you mumble under your breath. It has only been about an hour since the parfait, so you wait. After what seem like 3 hours, but is really only 30 minutes, you give in to the urge to eat and consume half of the lunch you packed…and it is only 9:30. 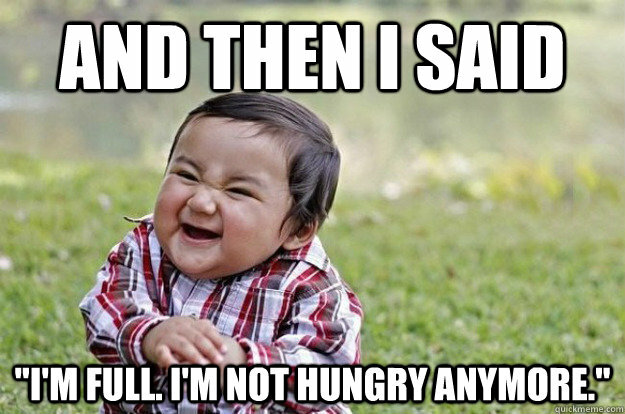 The feeling of ravenous hunger continues throughout the day. You didn’t over consume by much (as you do on some days when you can’t help yourself), but you were miserable all day trying to fend of the hunger. The above scenario is a little twist on a situation an athlete mentioned to me earlier this week. She noticed that when she trains harder she seems to always be hungry, which makes sense. The harder you train the more fuel your body requires. But when you have a goal of maintaining or losing some weight or fat mass, this can become problematic. So what can you do to help keep yourself from overeating and prevent yourself from being miserable all day trying to do so? …. 4, 5 in this case! The harder you train the more energy and specifically, glycogen you deplete. Glycogen is carbohydrate that is stored in the muscles. In order to fully recover, glycogen stores will be replenished. This allows you to have some more carbohydrate on the higher intensity days as the body will use them to replenish energy stores. On the high intensity days toss in an extra piece of fruit with breakfast or with your snack, a sweet potato with lunch or dinner and don’t be afraid to have a small piece of your favorite sweet something on some of these days for example…just make sure that the sweet something doesn’t make it in every high intensity day! 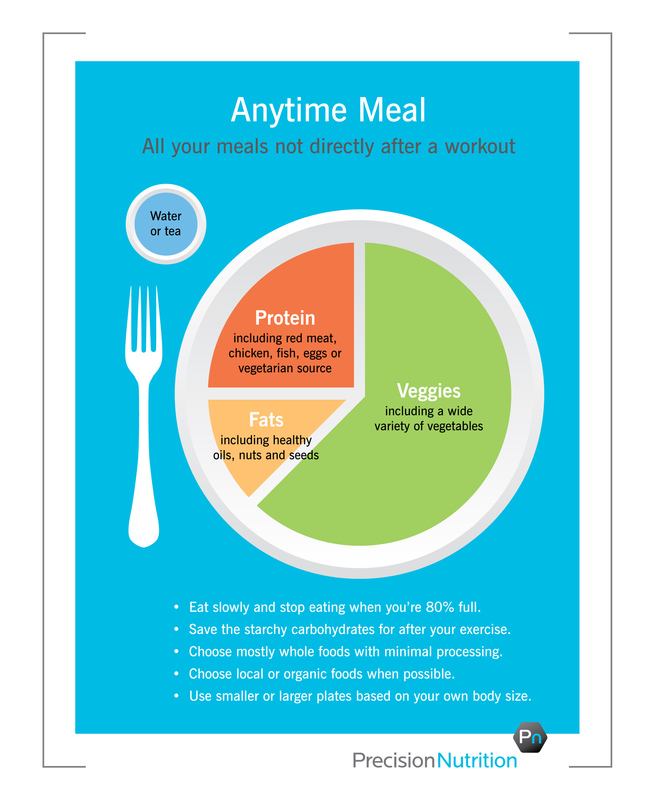 On the lower intensity days you do not need as much carbohydrate (or overall calorie) so forgo the extra carbs. A cookie on high intensity days every now and then is OK, especially if you work this hard to get it! Your stomach has sensory receptors that respond to the stretching of its walls. What does this mean? When your stomach becomes full, it expands and the brain is sent a signal that you are full. If you tend to feel hungry try drinking an extra glass or two of water with your meal and in between meals. Along with the water make it a point to eat more veggies, especially greens, as you can consume a large volume of these vegetables for little calorie. Protein is arguably the most important of the macronutrients when it comes to health and performance. Intense training causes the body’s tissues and systems to break down and protein is critical to rebuild and recover. Another other benefit of protein you may have heard of is that increases levels of satiety. As a nutrient that can help you recover and keep you feeling fuller for longer, protein, along with veggies and water, must be at the center of your meals and snacks. Lastly, slow down when you are eating!! Not only will it improve digestion, but it will allow your body to recognize when you are full (as it takes roughly 20 minutes to do so), preventing you from over eating. Try taking a bite, putting down your utensils, take a sip of water, spark conversation (if you are eating with someone else) and chew your food completely before taking another bite to help you slow down. Not only will you eat less, but you will feel more satisfied as you actually take your time and “savor the flavor” of your meal. For a more in depth description of how beneficial slowing down when eating is click here. **Bonus Tip: Stay Busy: The more you sit around during the day, not only are you promoting a sedentary lifestyle, which we all know is not conducive to health, performance or a lean waistline, but your mind has a greater opportunity to “tell” you that you are hungry. If you get this sensation of what I like to call “boredom hunger” get up and move, go for a walk, foam roll, etc…Whatever you want but try to replace eating out of boredom with activity! The next time your day gets off to ravenous start or quickly spirals into one, try implementing the steps above. Even if you don’t train, have a problem with constant hunger or you are an athlete looking to gain weight, the guidelines above will still promote enhanced health, performance and overall satisfaction when it comes to your meals (for those looking to gain weight just eat a bit more!). You need to train, and train hard and you should be able to cage the hunger animal inside you! Don’t forget SHARE this with your friends and family because they too deserve to enjoy their food.